From June 10-16 SEAHEC Future Health Leaders (FHL) joined FHL students from Arizona’s four other AHEC regions for our annual AHEC Summer Camp, an academic program that provides high school students a chance to sample college life and explore options for pursuing a health profession. Summer Camp gives students an unforgettable, visceral experience of what the possibilities are should they choose to pursue higher education and a health professional career. This year’s Summer Camp was hosted by Arizona State University (ASU) in Phoenix, Arizona. Students checked in to ASU central campus dorms at 10:00 AM Sunday morning. The first day was devoted to orientation for students and staff, a campus tour and team building exercises. Staying at the dorms afforded students the opportunity to get a taste of campus life, one of the principal strategies of SEAHEC Future Health Leaders Program. During the week, students acquired knowledge about sharing with a roommate, and exploring resources available to college students, activities that help to minimize the “fear of the unknown” often experienced by students from small, rural communities. 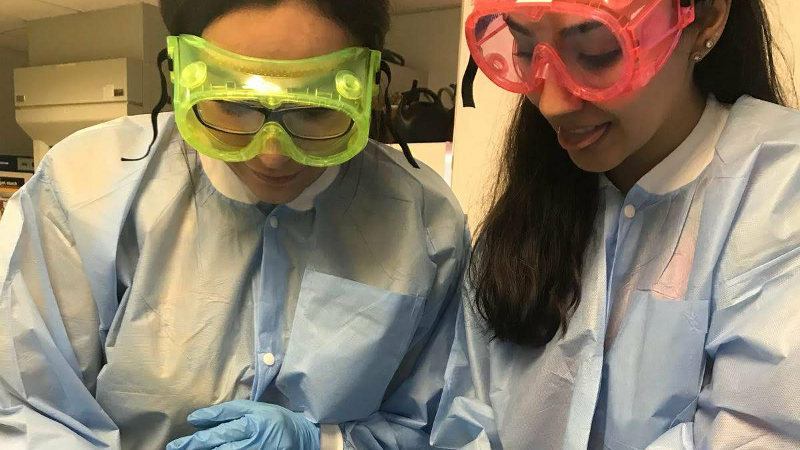 On their first day’s campus tour, students explored the microbiology lab, and opportunities to pursue a variety of health careers in fields like Public Health, Nursing, Behavioral Health, Science and more. As parents and guardians walked students to the dorms, some students appeared nervous or timid, others were excited and very enthusiastic to jump into this new summer adventure, which also allowed them to feel what it is to be away from home and reduce their fear when they go into college. Campers stayed very busy all week long starting their day from 8:00 am for breakfast in campus until 9:00 pm, checking out on Saturday afternoon. Monday began with a walk to nearby University of Arizona (UA) College of Medicine campus at Phoenix for a tour of the UA Center for Simulation and Innovation “Simcenter,” “a state-of-the-art, multimillion dollar mock clinical facility for students and the community.” Students toured the lab there where they learned how medical students use Manikins to practice clinical skills. After the Simcenter tour, UA Phoenix Public Health Coordinator Kim Barnes MPH, Health Behavior and Health Promotion, provided an overview of Public Health, and presided over a survey of health research topics, including behavioral studies, critical trials, genetic studies and more. 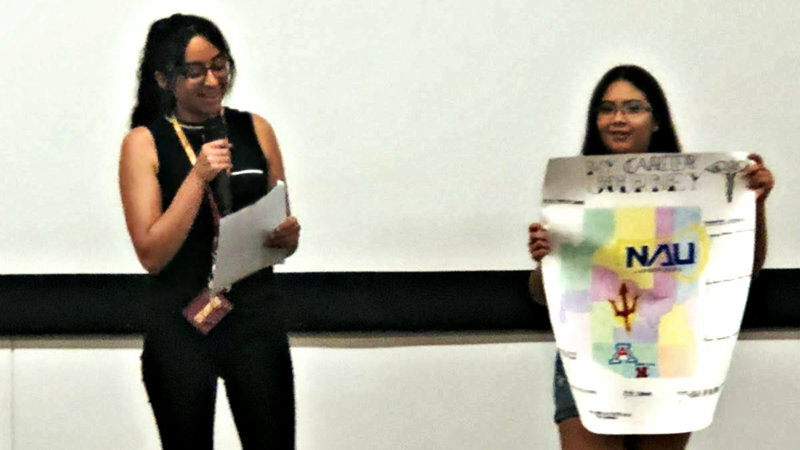 On Tuesday, students traveled by light rail to the ASU Tempe Campus where they began their day with an official admissions tour and a Speech and Hearing Sciences presentation. In the afternoon, students participated in a resume writing workshop and worked on a special project. The special project involved each student identifying and researching, in detail, a possible health profession of interest. Students project research included: type of profession, educational requirements both in college and in high school to gain admission to the college(s) of choice for that profession, colleges or universities that offer that degree or program of study, cost of tuition, scholarship possibilities, job prospects and salary ranges in Arizona for the profession chosen. Students had ample time to work on their research and the final day of camp, presented orally and utilizing a poster, to highlight their findings. Wednesday, students met with Tashina Machain, former SEAHEC FHL Program Coordinator, at ASU’s Center for Health Innovation for an interactive exercise on “What is Public Health.” Ms. Machain is now Outreach Coordinator for American Indians into Medicine (AZ INMED), a program of the UA Office of Diversity and Inclusion and the Arizona Health Sciences Center. In the afternoon, students explored nutrition topics and how nutrition impacts health. Nutrition topics also dominated Thursday’s agenda which included a healthy lifestyles coaching session, after a presentation from ASU Nursing School staff, on the different academic requirements and career options for nursing. On Friday, students visited the ASU School of Life Sciences and got a practical introduction to Biology when they dissected a cow eyes. Several students commented that the dissection was one of their camp highlights. They later toured the ASU Microbiology Lab. After a dip in the ASU pool, Students visited ASU Department of Biomedical Informatics and the College of Health Solutions for a tour of the Kinesiology lab. In the afternoon, students put the finishing touches on their projects, which they presented on Saturday morning, before dorm clean-up and checkout. 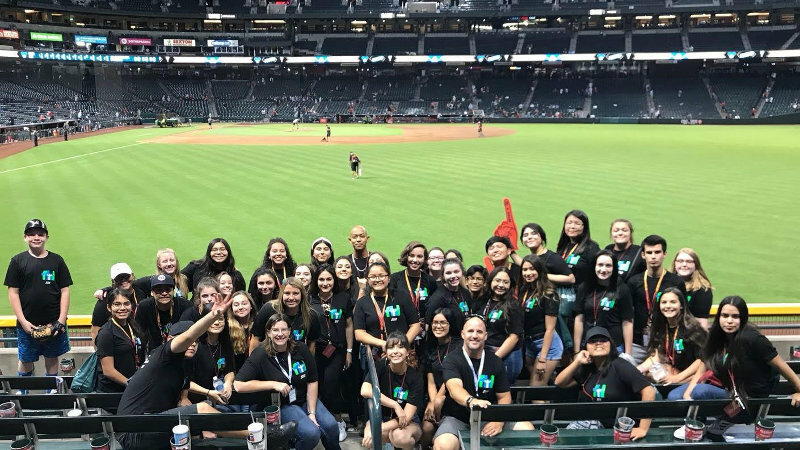 While students shared a week packed with academic activities, they also had several chances to relax and sample entertainment activities available to students who choose Phoenix as a study destination. Evening activities included AMC Movie Night and Bowling at the Main Event, a popular Phoenix eatery. They also got to go to an Arizona Diamondbacks basketball game at Chase Field. The students benefited from the experiences of Lidi Esquivel, a Nogales, Arizona native who accompanied them to Summer Camp. Ms. Esquivel holds a BS in Public Health. She is also an Undergraduate Student Ambassador to the Mel & Enid Zuckerman College of Public Health, and helped to chaperone Summer Camp students. Tagged fhl summer camp, Summer 2018.